The school year 2016-2017 I am delighted to say started and ended in celebration. We began the school year with our annual Con Creedon Awards and we are delighted to report that 90 students received funding this year to help them in their chosen college course. Judging on the recent Leaving Certificate results these high numbers are going to continue. 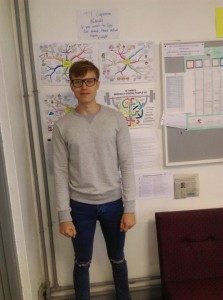 Our overall student of the year Antanas Murelis (pictured below) achieved 542 points and has accepted a place in Trinity College to study science. Another student who I believe you should all watch carefully over the coming years is Darshan Pokhrel. Darshan already has his own very successful YouTube channel, he graduated with an excellent Leaving Certificate however he is taking some time off before college as he has been offered a job in London to become a travel blogger. This will involve Darshan travelling to three different countries a month and blogging his experiences. He is also working with Sky Sports, editing and making videos. 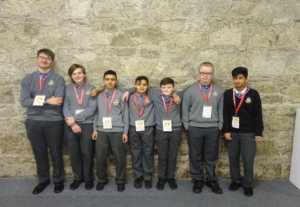 Earlier this year Darshan had represented the school in a national photography competition and won the Leinster Division. 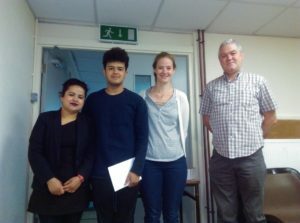 Darshan is pictured below with his mum, Ms Eastman and Mr Derek Lynch. The day of the Leaving Certificate results also was Mr Derek Lynch’s last official day in Synge St CBS. Derek started in Synge Street in 2005 and as you are aware was appoint Deputy Principal in 2015. Derek has taken the position of Principal in New Cross College in Finglas. 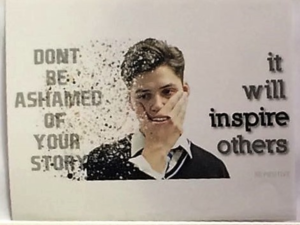 We wish him all the best but he will be missed by the students and staff. I have to thank him for his dedication and friendship over the past two years. Ms Lesley Plunkett has been appointed as the new Deputy Principal. Lesley is no stranger to the role as she acted in the role when I was out on maternity leave in 2012. Lesley has been on staff here since 2005 and with her previous experience in marketing and business she has a lot to bring to the role. I am delighted to be working with her and we are both looking forward to the year ahead. 2016-2017 also saw the reintroduction of Transition Year. The funding we received from the Past Pupils Union this year helped to provide a wide and varied curriculum for the students. 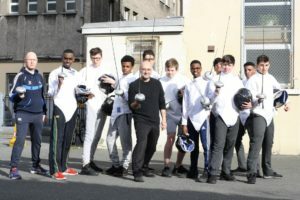 Highlights included fencing, canoeing, and a three day trip to the Gaeltacht in Mayo, work experience and working with Templebar Galleries. I would like to thank all those past pupils who provided work experience for the students; it was a very enriching experience for them. This year’s TY I am delighted to say is oversubscribed. Once again it was a great year for our Young Scientists. This year four different groups entered. Five different prizes were won and a whole school assembly was held on their return with a very special guest, none other than Mr Jim Cook. The students have already begun their preparations for 2017 and have been in throughout the summer working on their projects. In the area of sport we continued our winning ways in Judo. We reclaimed the top spot in the All-Ireland Judo Championship. We also had great wins throughout the year in hurling, Gaelic, soccer and Basketball. I have to thank the teachers who give up their time to ensure that our pupils have a wide range of extra-curricular activities to participate in. This Wednesday (30th of August) our two new first year classes will start. Lesley and I look forward to keeping you updated on their progress and other events throughout the year. We would like to take this opportunity to thank you for your ongoing support and l am sure we will get the opportunity to meet with many of you at the outstanding events that Damien and his committee organise. Looking forward to working with you all during the year.